According to the Air Transport Association, a person could fly every day for 3,859 years without being involved in an aircraft accident. That's an accident rate of one accident for every 1.4 million flights, according to a CNN report (based on 2009 data). Air travel today remains safe, thanks in part to accident investigation. Findings from accident investigators pave the way for important safety improvements in aviation, like the recent changes to pilot duty and rest requirements that address the pilot fatigue problem that was a factor in so many accident reports. These changes are preventing accidents and saving lives. The accident investigation process is fairly simple on paper but can be complicated by intangible things like politics, legal action, and international differences, as well as physical demands such as rough terrain or post-accident damage from weather. There are many parties and factors involved in aircraft accident investigation, as outlined below. Who's Involved in an Investigation? IIC: Every aircraft accident will have an Investigator-In-Charge or IIC. It is the company or entity in charge of the entire investigation. NTSB: In the United States, the National Transportation Safety Board is the authority on aircraft accident investigation, with the exception of some government and military accidents. 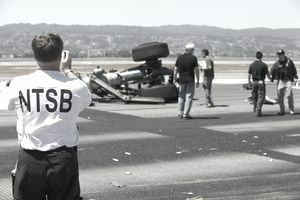 In addition to their domestic duties, NTSB officials are often called to assist in foreign accidents based on their high level of experience and knowledge. Further, the NTSB can choose to investigate an incident or accident that they would not normally investigate to complete studies to enhance aviation safety further. ICAO: The International Civil Aviation Organization doesn't have any authority over a country's investigation board, but it does produce standards and protocols that should be followed for accidents that represent two or more countries. FAA: Although some might think that the FAA should be investigating airplane accidents, we're lucky that they don't! They do take part, mostly to determine if any regulations were broken and in general, to be aware of safety issues and legal action that might be necessary. Local Police/Fire/Medical Examiners: If an accident occurs at an airport, the airport's emergency plan will go into effect. For obvious reasons, the local fire, police or medical workers may be witnesses to the events just after an accident and are important to the investigation. FBI: The FBI gets involved when accidents involve a national security breach or terrorism event. Others: Various other organizations and officials may be involved in the post-investigation process in one way or another, either contributing to the investigation, as a witness or as in the case of the news media, a logistical addition. These other groups might include the aircraft manufacturers, aircraft operators, insurance companies, each EPA, the media or independent investigators and consultants. A major investigation will likely be conducted in the case that it involves a large airline, important people, or terrorism. An entire team of people and resources will be devoted to a major investigation. A limited investigation, on the other hand, involves mostly light aircraft accidents for which the NTSB reviews an operator-submitted report. According to Air Safety Investigator Grant Brophy, "limited accidents are typically investigated by phone with various parties, based upon information reported on NTSB 6120.1 form." If the accident is big enough or important enough, the IIC will launch a "Go-Team," which is a group of people predetermined to react to an accident of magnitude, such as an air carrier accident. The "Go-Team" usually includes the IIC, an NTSB board member, and various specialists, depending on the accident type. If for instance there is preliminary information that an engine failed, the aircraft's engine manufacturer and engineers will participate. Even before they arrive on the scene, the IIC will work to set up an operational base from which all members can be organized and given specific duties. Local police, fire, and rescue will be coordinated, as will security for the accident site and media initiatives arranged, when needed. First and foremost, victims and witnesses will be identified and given aid. The wreckage is then examined, photographed, videotaped and preserved. In some cases, it is sent away to be further examined at a lab. During the course of the investigation, measures are taken to secure wreckage in the way of hazardous material and other dangers to the investigative crew. Then the investigators will each work on their prospective assignments, depending on individual needs. A wreckage analysis is done to determine landing impact, velocity, and angle. The status of the propellers, flight instruments, and even the passenger seats can tell investigators a lot about what might have happened. Once the field investigation is complete and each party returns to its respective office, reports are written regarding the findings. Each party to the investigation typically drafts its own findings and analysis of the accident and submits it to the NTSB. The NTSB reviews each report and completes its own individual accident report. Eventually, (sometimes years after an accident), the report will be finalized. Members of the public can search the NTSB database of accident reports to find out details of specific accidents. NTSB aircraft accident reports are used widely in the aviation industry. The reports are thorough, and the NTSB does its best to include the entire story from an impartial viewpoint. The NTSB also makes safety recommendations in each report to various parties, such as the FAA, aircraft manufacturers, airlines and air traffic controllers. These recommendations often spur action from organizations such as the FAA, preventing future accidents and ultimately, saving lives.